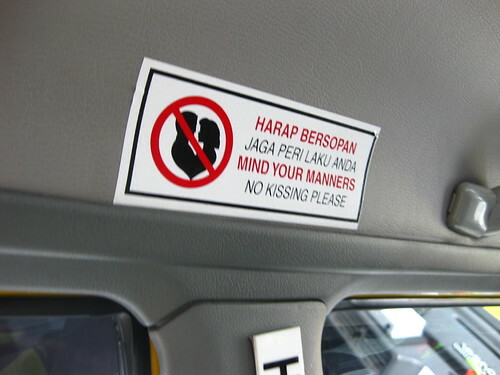 This was a sign that was in a taxi. It implored its passengers to refrain from kissing. One might think that this is peculiar to Malaysia, prudish admonishments from a predominantly Muslim country. But actually, I’ve found that such modesty is the norm throughout Southeast Asia, in Buddhist countries as well. Yet I observed locals holding hands and couples showing public affection for each other. I didn’t feel it was such a big deal there in general, compared to Thailand and Cambodia. Malaysia was my first experience in a Muslim country, where sharia, or Islamic law is practiced. (I don’t count my travels to Indonesia since I was only in Bali, a Hindu enclave. I suppose I could count my time in England where I lived among Pakistanis.) Counter to my expectations, I didn’t feel restricted at all. Of course, mine was a skewed perspective, since I was in a surprisingly cosmopolitan city, and then an international resort area. Sharia doesn’t apply to non-Muslims. The heathens can drink alcohol, whereas the faithful cannot, for instance. 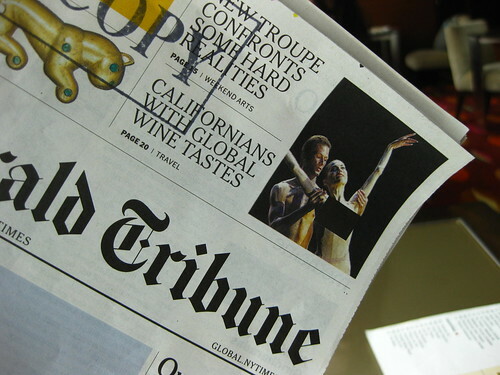 On the other hand, I did see censorship, like this blacked out photo of a ballet dancer. I guess the leotard was too revealing. Malaysia’s a pleasingly multicultural society and from my superficial experience there, people seemed to co-exist pretty peacefully. Half are Malay, a quarter are Chinese, about 15% are Indians and the rest are tribal members of the Borneo jungles, and expats. What this has led to is great food. It’s an eclectic mix. It’s also led to what appears to be a certain level of religious tolerance, as I saw Hindu and Buddhist temples. Here are some other observations about the culture and people I came across. Unlike other Southeast Asian countries, shopkeepers and taxi-drivers aren’t aggressive. Although, when I went into one airport store, the Chinese shopkeepers kept following me around and offered me deals on everything I looked at. We didn’t go to the markets but there wasn’t any haggling anywhere. Like the rest of Southeast Asia, open conflict like shouting or showing anger is considered immature and is to be avoided. Malaysia is not a smiling culture. No one was unfriendly. But no one smiled. Eye contact was also avoided. I found myself avoiding eye contact too when I interacted with service workers. I also stopped smiling as it seemed to make the women uncomfortable. The youth are quite contemporary, non-traditional in their dress, resembling most Japanese fashions. Many young men had earrings, which I never really see around Asia. I didn’t observe an obvious division of labor in Kuala Lumpur. I’ve read commerce is dominated by the Chinese and politics by the Malays. Grunt labor seemed to be filled by Indonesians, Filipinos and Tamil Indians in the city. In Langkawi, most of the reception staff were Malay or Indonesian, and the cleaners, waiters and attendants were Bangladeshi. I chatted at length with the Bangladeshi and they all seemed to have one relative in Japan and one in the US. Also, every first time conversation began with a recitation of how long they’ve been in Malaysia. “I have been in Malaysia for 1 year and 2 months.” They were all very kind. At our resort, most of the tourists were Russian, German, Dutch, Australian, Arab and Indian. There were sprinklings of Chinese. I also noticed a Korean couple. But I was surprised to find no Japanese. I’m sure it had a lot to do with the fact that there were no Japanese holidays while we were there. I’m certain their visits are concentrated during the New Year and Spring holidays. I could understand the large number of Russians and Indians and Chinese. This is all the new money. And Aussies live nearby. But why the disproportionate number of Dutch? I thought about how all those Russians and Chinese must be very rich. But then thought how Americans and Japanese are very privileged, since just middle class folks like me could come here. The middle class of the US and Japan are as rich as the rich in other countries. In Kuala Lumpur, there were some Americans but they were mostly people like me who lived around Asia. 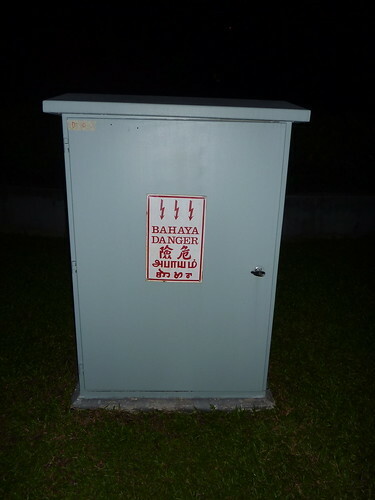 I liked this sign, warnings listed in four languages, plus a graphic. Everyone spoke English as it’s one of the national languages, and the unifying one of a population that speaks Malay, Chinese or Hindi. It’s also a colonial legacy, since the Brits controlled Malaysia longer than anyone else. While all the other nationalities spoke English to varying degrees, the Russians spoke nary a word of it. Like nothing. I observed them even ghostwriting their room numbers in the air, instead of just saying it. There were quite a few Arab tourists. I don’t observe them much in other places in Asia, but I’m sure they prefer Malaysia since it’s a Muslim country. Sadly, in the 40 degree heat (about 90F), the women always wore heavy black veils that covered everything but the eyes. They weren’t the sheer light scarves worn by the local Muslim women. They were heavy fabrics. Others still wore the full burqa. They were always black. I thought that white would at least alleviate the heat. The men, their husbands and sons, were in t-shirts and shorts. I can respect the choice towards modesty, however you define it, but that was too much. Couldn’t the men show some solidarity by wearing trousers and long-sleeved shirts? After all, they’re the ones who made the dress code and enforce it. The one cultural thing that I had problems with was the use of the right hand when handing things to another person. I’m a leftie, so I constantly had to hastily switch money from my left hand to my right hand. The left hand is considered unclean since it’s traditionally used to clean oneself after using the toilet. Most Malaysians seemed amused when I awkwardly switched hands. but I did catch flickers of hesitation during the times I forgot and used my left hand. ah! a simple explanation. they seemed to come in large groups. either they were a tour group or a large family. but they all seemed to know each other. My world travelling husband visited Malaysia a few years ago on business and thought it was the most beautiful country he’d seen. Could the Dutch be more visible there because of Malaysia’s proximity to Indonesia, a former Dutch colony?